Dog parks – the social scene of the dog world. Taking your dog to a dog park is a great addition to their exercise routine and a great way for your dog to maintain healthy socialization skills. However, there is proper etiquette to be considered when visiting the dog park. If you want the other dogs to wag their tails in approval and the other dog parents to greet you with a smile, then there are certain rules that should be followed – here is a list of ‘Dos & Don’ts’ to follow at the dog park. Here are some tips that are guaranteed to help you and your dog both win the popularity vote at the dog park. This one is first on the list because it is THAT important. If you aren’t cleaning up after your dog poops in the park then you are probably on someone else’s list – a blacklist. If you really want to earn some brownie points, pick up any other dog’s messes that have been left behind. -Exercise first, dog park second. Taking your dog to the dog park should not be their primary source of exercise – it should supplement an already existing exercise routine. In fact, the proper thing to do is to exercise your dog before taking him to the dog park, in order to release any pent up energy that could affect his behavior at the park. -Supervise your dog while at the park. Let’s be honest – we’ve all seen the dog owner at the park who sits on the bench and stares at their smartphone while their dog terrorizes all of the other dogs at the park. Don’t be this person. -Leave the kids at home. 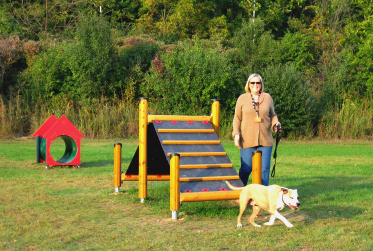 We know that your kids probably love their dog and a trip to the dog park probably sounds like a dream come true to them, but the dog park isn’t really a place for small children. There is a lot of heightened interaction going on between dogs at the park and not all dogs are crazy about kids. -Be cautious about handing out treats. If you are using treats for training purposes while at the park, be sure that there are no other dogs in close proximity to you. The best advice would be to skip the treats until after you have left the park to avoid any unnecessary confrontations and don’t ever give treats out to a dog other than your own. It is important to always promote peaceful and pleasant interactions at the dog park so that everyone can enjoy their visit to the park. There are certain things that you just shouldn’t do while at the park with your dog. DON’T bring a sick or unvaccinated dog to the park. If your dog is sick, not up to date on vaccinations, or if you are unsure of your dog’s current health status, leave them at home until you know that your dog isn’t capable of spreading disease at the park. DON’T allow your dog to bully other dogs. If you notice that your dog is causing problems or is being the dog park bully, remove them from the park immediately. DON’T bring your BLT to the dog park. Never bring human food into the dog park – we shouldn’t have to explain the problems that this could create. DON’T bring a dog to the park who doesn’t respond to verbal commands. Does your dog come when they are called? Do they respond to your commands? These are basic training skills that your dog should have before turning them loose at the dog park. First things first. DON’T keep your dog on a leash in a ‘no-leash’ dog park. It doesn’t really make much sense to take your dog to the dog park if you plan to keep them on a leash the entire time. Plus, it can present safety issues for other dogs, especially if you are using a retractable leash. Are you ready for your next trip to the dog park? Brush up on your dog body language signals so that you know how to recognize signs of trouble. A little dog park etiquette can go a long way to making the dog park a happy place for both pets and owners!